On soundstage seven in Columbia Studios Hollywood crews are relearning their trade. Hundreds of cinematographers have signed up for the free three-day courses run by Sony's 3D Technology Centre that opened on the lot in January. "It's easy to make 3D," explains Buzz Hayes, chairman of the new facility, "but it's very hard to make it good." Columbia Studios' training school reflects Hollywood's concern that a rush to ride the Avatar bandwagon will lead to an inferior product that could do the 3D format more harm than good. Here are nine lessons in 3D movies that Hollywood has learnt. Hayes says that talk of 3D being a gimmick is ridiculous: "We see our world in three dimensions and should build our entertainment into that." But he is not expecting all Hollywood releases to be 3D, pointing out that it took a long time for colour to fully replace black and white. When we visited the set, a cameraman was demonstrating the two-camera 'splitter rig', where one camera is mounted on top of the other. As stuntmen work through a fight scene in an alley-way left over from the last Spider-Man film, he experiments with the stereoscopic effect by adjusting the space between the two lenses. When a fist bursts out of the monitor at the side of the set, the small audience wearing the obligatory dark glasses gives appreciative applause. The 3D industry is creating new and exciting roles for film crews. Opportunities are opening up for 'stereographers' and 'convergence pullers'. New principles for film grammar are starting to emerge. "We have to understand how to tell 3D stories because we're not fully there yet," says the Sony man. For example 3D films require fewer edits to establish spatial relationships. Directors, DOPs and camera operators all learning that lighting has to be used to focus attention on a part of the screen rather than the traditional depth-of-field techniques. Hayes says 3D has already outgrown pop-out screen effects and can develop into something much more dramatic, not just for action blockbusters. "The psychological impact has not been explored yet. When you think of the scene in The Silence of the Lambs, when Hannibal Lecter steps forward to intimidate Clarice Starling, he stays in the frame. Imagine it with 3D, and he would step out of it and be in your space." Retro-fitting 2D films with 3D can be done at a cost of $50,000 a minute, but results can be mixed, as Clash of the Titans has proved. On the other hand, it's fair to assume that if there is money to be made, it will happen. James Cameron has already revealed plans for a 3D version of Titanic, so expect other older classics to be given the treatment. Hayes has reservations, also clearly recounting the disasterous colourisation of black and white classics such as Night of the Living Dead and It's A Wonderful Life: "Some would be great fun," he says, "but some would be like spray-painting the Mona Lisa." Buzz Hayes has some interesting advice for broadcasters such as Sky about shooting football in 3D. "They need to rethink their camera positions," is his verdict. Stereoscopy works better when shot diagonally across a football pitch, for example, rather than the halfway line. And because one rig provides more depth, less camera positions are required. Nominated for 13 Oscars, Greg Russell has worked on a number of blockbuster hits including both Transformers, Spider-Man 2, Enemy of the State, Pearl Harbour and The Rock. Standing in front of the tools of his trade, a vast mixing console running Avid Pro Tools, he talks passionately about his job. "A movie doesn't come alive until the sound is there, but you have to get the balance right. It's about flying sounds around to envelop a room but at the same time making sure it doesn't distract from following the movie." 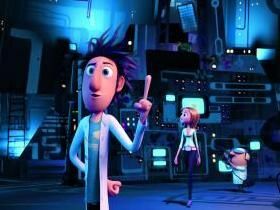 Russell mixed Cloudy with Chance of Meatballs in 3D and says the new format is throwing up fresh challenges. "It's about experimenting with audio depth to accompany the pictures. You use very dry sounds, for example, to suggest something close up. It takes even longer to get right."